MUNICH, GERMANY – February 11, 2011: The 2011 Geneva Motor Show will see the world premier of the BMW Vision ConnectedDrive concept car. The concept study, in a two-seat roadster guise, presents the automobile as a fully integrated part of the networked world in both its design and technological innovations. It is with this concept that BMW presents the potential of current and future in-car technology for optimising comfort, safety and infotainment. The BMW Vision ConnectedDrive employs a layering principal in its design, demonstrating the bond between the driver, passenger, vehicle and the surrounding environment. This is visualised by the complex light installation which shows the path of data exchange with the driver and passenger as the start and end point of each interaction. The interior is divided into three layers – comfort, infotainment and safety – each with a corresponding light installation. Each layer is defined by a colour, rhythm, motion and texture and, through the transparent surfaces the path taken by the information can be seen via fibre optic lighting. The first layer focuses on safety, with a red light wrapping around the driver and coming together in a cone on the bonnet. This represents the flow of safety-specific information and the driver’s focus on the road ahead. The second layer encompasses the safety layer and extends to the passenger cell, focusing on infotainment. This layer promotes active social exchangement between the driver and passenger and is outlined by the blue ribbon of light. The final layer, defined by the green light flow, concentrates on the interaction of the vehicle with the world around it. The emphasis is on the outside of the vehicle, starting and ending with the two antennas, in place of wing mirrors, providing the data link to the surrounding environment. The layering principal in the BMW Vision ConnectedDrive requires individual components to perform a number of roles. This can be seen in the headlights and rear lights with their integrated sensors monitoring the traffic and external environment which feed information directly to the driver allowing him to take appropriate action. The concept embodies the dynamic BMW design language with its long wheelbase, set back seating position and long bonnet but combines it with taut surfaces and distinctive flowing lines. This results in an interesting play of light and shadow making the car appear as if it is accelerating even at a standstill. The sliding doors, inspired by those on the BMW Z1, disappear into the body of the car. This allows the BMW Vision ConnectedDrive to be driven with the doors open, emphasising the link between the vehicle and its environment. 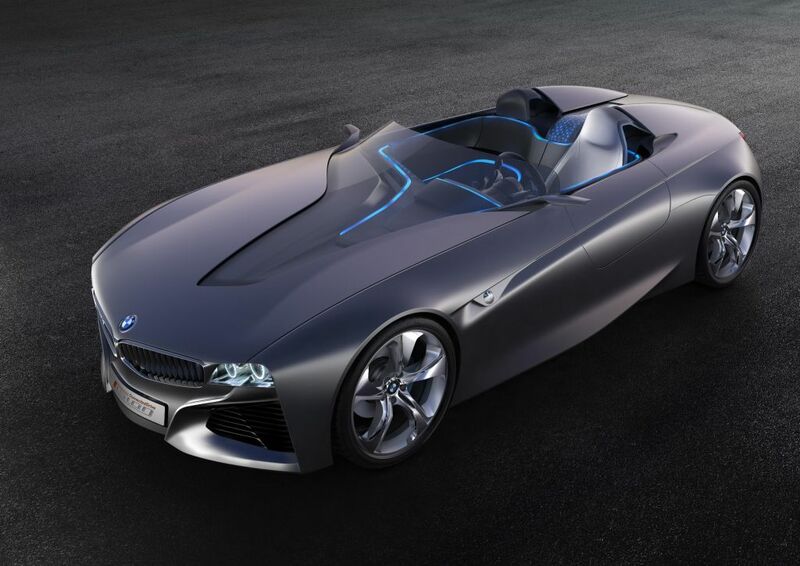 The BMW Vision ConnectedDrive showcases the current and future capabilities of BMW’s ConnectedDrive technologies. Advanced Head-Up Display takes the technology currently available in production BMWs even further, placing a three-dimensional display of key information in the direct sight line of the driver, eliminating the need for the driver’s eyes to refocus. The three-dimensional display allows the real view to be overlaid with virtual information, highlighting hazards allowing the driver to assimilate all of the information quickly and take appropriate action. In addition to Advanced Head-Up Display the BMW Vision ConnectedDrive is equipped with a freely programmable instrument cluster to provide the driver with additional information, optically emphasised to a greater or lesser degree. While for the first time passengers get their own information display, out of the driver’s field of vision, allowing them to evaluate information, music or navigation details and pass them onto the driver with a simple touch of a finger.